Leadership of the terrorist group Hay’at Tahrir Al Sham, led by the notorious terrorist Mohammad Al Joulani, who is also known as the leader of Al Nusra Front, has issued a statement, saying the group is not interested to participate in any round of Astana or Geneva talks on settlement of the Syrian crisis. The statement comes as a partial response to the announcement, previously made by Ibrahim Kalin, Erdogan’s assistant and press secretary, on the entry of the Russian and Turkish troops to the embattled Syrian province of Idleb. Earlier, Kalin said Turkey and Russia will start to dispatch soldiers to the north-western Syrian province of Idleb, particularly to the areas, which are, according to the Russia-brokered memorandum labeled as safe zones, with Iran and Turkey acting as guarantor states of the memorandum and its execution. This will also be the key matter of discussion at the forthcoming round of talks in Astana, scheduled to take place in early July. The position of Hay’at Tahrir Al Sham was reportedly taken after it was reported that the forthcoming round of talks in Astana will also be dedicated to finally make complete distinction between the groups labeled as “opposition” and those who are considered as terrorists (Al Nusra/Tahrir Al Sham including). 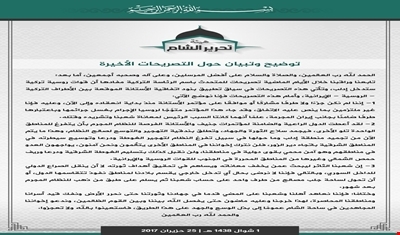 As such, Hay’at Tahrir Al Sham/Al Nusra Front now fear that an agreement with the hostile group Ahrar Al Sham will be made in Astana, a thing that might even result in an assault on Tahrir/Al Nusra positions in Idleb province. Not too long ago, the rival group Jaysh Al Islam stormed Hay’at Tahrir Al Sham positions in Eastern Ghouta suburban area of Damascus. In addition, Mohammad Alloush, the leader of Jaysh Al Islam, has already participated in Geneva talks. The north-western province of Idleb is currently under control of various Turkish-backed terrorist groups, most notably Ahrar Al Sham. The area also has a large presence of the Al Qaeda-linked Al Nusra Front/Hay’at Tahrir Al Sham and the aligned groups.